Blog/ Journal of thoughts and opinions coming from events and talks that have been attended. Inspirations for trend projects and other points of interest: art, travel, food, lifestyle and, of course, fashion. The rest of us make small improvements as we can accommodate them and strive to continue to do so on our quest of low impact living. Personally, I’ve composted by dragging pounds & pounds of food waste into Union Sq from Queens and Brooklyn and not been bothered by it, thinking of the bigger picture. I also recycle textiles, corks, Brita filters and batteries, as well as any electronics- all pretty easy to do with the cooperation of the City of NY and Whole Foods supplying collection facilities. So, I was pretty excited to see what this pop-up, Package Free, had in store to help make lives even less impactful on the environment. Singer teamed up with another well-known face in the eco-world of NYC, Daniel Silverstein, a fashion designer known for zero waste in his work. He was working the store when I called in and some starstruck visitors were taking selfies with him- awww, cute. Loved that they knew who he was. The store is stocked with the expected items (see their website) and was pretty much what you’d expect from a store that eschewed packaging and clean living, including Singer's own brand of laundry products, The Simply Co.. Classes and lectures are also offered in the space, helping create conversation in addition to educating. A temporary space for now, if proven successful, a more permanent spot may be up for consideration. As the amount of people (re-)considering their environmental footprint increases, stores like this should become more commonplace- as they are in Europe. Awareness is a great start and, let's remember, small actions, amplified, have large impacts. I love marketing, but......mini rant ahead. I've been catching up with reading stuff that came while I was away in Australia. While browsing AdAge I read this (above- it's behind a paywall so I couldn't link it and if they find it they'll probs make me take it down so read fast!) and it made my stomach turn...Chlorox, a huge corporation that does $5.8 BILLION in annual sales, went to Kickstarter to launch a brand to make it seem more authentic as a small brand. WTF? When the whole world is talking about authenticity & transparency, this is what they think is a good strategy? 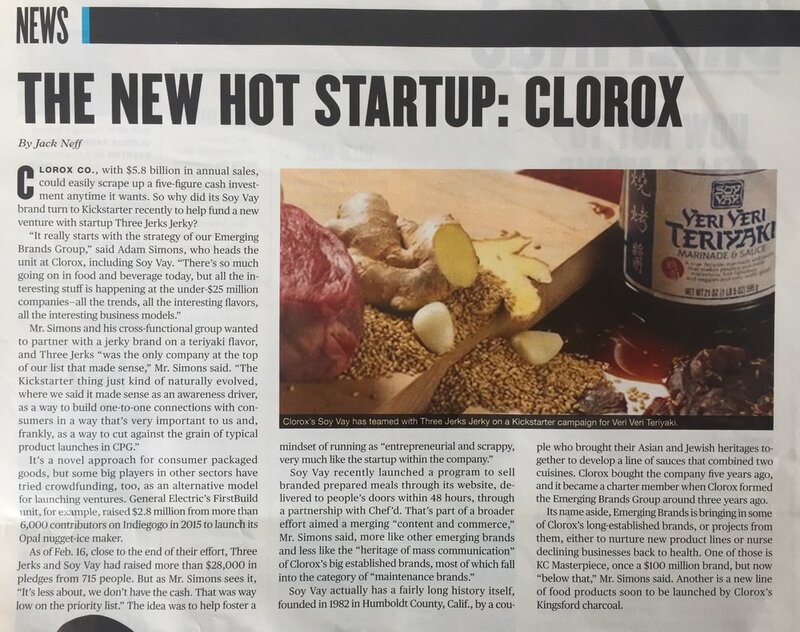 The article even quotes one of the guys from Chlorox's 'Emerging Brands' team saying that it was less about money and more about giving the impression that they are "entrepreneurial and scrappy." They'll attempt to justify it by stating that it is, in fact, a small brand (that they purchased five years ago) with a solid backstory based on immigrant's coming together to create a new flavour fusion but I think the more important issue is that they are betraying that story by pretending to be something that they're not. It was a packed house for the Sustainability: The New Luxury event, which had long-time eco-fashion advocate, Julie Gilhart interviewing Gabriela Hearst about her collection. I go to a lot of talks about sustainability in the fashion industry; it's a topic I've been closely following for more than 10 years. Often, it's more of the same with the same questions from the audience with the same challenges and solutions discussed. * A conversation around the idea of "Who cares if you have the bigger brand if the environment is suffering?" Riiiggghhht? * Talk of trends- or rather, of not following them- and the idea of 'timeless' pieces: Something should pass the 10yr test- is it still stylish after 10yrs? If so, it probably still will be 10 years in the future. * Gabriela talked about buying deadstock from luxury mills and how it allowed her to feel that she was helping to 'clean up,' and that the idea of clearing out is our responsibility too, that we need to use what we already have. This 'waste' means that there are only a limited number of pieces that can be made (for example, she was able to make only 10 coats from a leftover Loro Piana fabric and 50 of another) which also means that in such limited quantities, they are REAL luxury. * Hearst believes in wellbeing and has introduced a textile that blocks radiation from cell phones into her jacket pockets after realizing many of the wearers carry their phones in them. The elegant townhouse was the perfect setting for Matches to be #inresidence. Their typical shopper may be used to such digs but for many of us it was an escape into that aspirational world where our home (with a WIR that is full of $4,000 dresses!) is graceful, tasteful and the perfect place to host our BFFs that come to sit and chat about fashion that improves the planet. Melbourne is famous for its street art, especially that of the many laneways where graffiti perfectly coexists with dumpsters and milk crates. Almost every lane you look down is decorated and the obligatory photo shoots are occurring in front of them. Comical, yet understandable, my hope is only that the photographers are actually looking at the art, and not just snapping more Instagram clutter. That's certainly one thing that's changed since I was in Melbourne last. Like many cities, Melbourne's grittier neighbourhoods are now getting taken over by hipsters and they bring the boutiques, restaurants and coffee shops that are now safe to walk home in the dark from. I had dinner with fashion aficionado, Karen Webster, at Charcoal Lane , an Aussie-centric cuisine with a social cause kinda place (I had the emu- pic on my Insta). It was excellent and you should go there. One thing I always love about Melbourne is that the people working in the boutiques are well-informed: not only about their merch but also what's going on in general. I had several lengthy conversations about the collection they're selling, other stores I should visit with similar aesthetics and local designers with the staff with zero snobbiness or pressure to buy. Makes you want to come back. One of my favourite stops was E.S.S., a store that reminded me of something I might see in Paris, with conceptual pieces in gorgeous fabrics. Not my style but certainly worth appreciating the concept and aesthetic with all of it's old world details. It's a look that always makes me think of Melbourne. Gertrude St in general has loads of little stores & cafes/ restaurants. I was running short of time after all that socializing with the staff so had to run. Next time I'll hit it up right and tell you all about it. Flinders Lane and other smaller side streets and lanes also have some cute finds and can often be discovered accidentally (get off the main streets!) I was looking for Aussie designers so wanted to stop by a few in the CBD: Lucy Folk for jewelry on Crossley St , Elk on Little Burke St and an old favourite, Assin, which has changed their label profile to include a private label. Note the art in the stores. These are all original pieces integrated into the design (or, in the case of Assin, actually part of the design as the artist painted in situ) and bring an extra level of creativity to the brand- as it makes it more than just branding. another major differentiation to the influx of foreign, major brands coming into the Australian market. Melbourne's worst kept secret, Curtin House, not only has the old- faithful bar/resto Cookie and Melbourne's best rooftop bar in it, but also some boutiques that are worth looking at for something refreshing after a day of mainstream label 'shopping.' Level Three is the place to be. Quick trip to Sydney: I hadn't been to Sydney in years (or yonks as we might say in Oz) and I had meetings, catch-ups and a workshop to fit into 2 days so it was a pretty restrained trip. A wander around the Rocks & Miller's Point with some store research (the invasion of foreign brands!) was the extent of touristing and we had amazing weather for it. The thirst quencher above was a notable cider by Young Henry's, brewed locally in Newtown and served at Hotel Palisade . Take note, gluten intolerant people, 'cause lots of ciders are just a sickly sweet mess and this one was not. Small Australian brands thrive in a mass-market landscape with many having small boutiques that provide personalized service. The beautiful, old arcades like the Strand Arcade make the perfect backdrop for them; just entering them takes the hustle of a city away and allows for a little relax time. At the same time, foreign brands get space to show their whole line: the new Cos store was bright & airy and had space to show each group of the collection- something they would be unlikely have space to do in NYC. I could see the clothes! Made me want to shop. Another noteworthy stop was Harrold's in Westfield Sydney. A pretty decent mall for a CDB modern mall with a food court that looks like you can eat there and luxury stores for you to spend your bucks at. If I had lotsa bucks, Harrold's would probably get some, just for the shopping experience alone. Hometown Adelaide....I've heard there's a lot of new places to go and things to see but I had little time and had family to spend time with as well as a guest lecture at TAFE and a workshop so that all has to wait until next year. On my way to my workshop- held at Australian Fashion Labels' gorgeous head office- I stopped by the studio of jewelry designer Marie-Pier Labelle of Days of August. I met her in NYC and had to see her in action- little old Adelaide is getting some attention on the fashion scene for its emerging talents, and this charming French-Canadian is on her way, having garnered attention from MoMA in NY, along with others. She's charming and her company is sustainability focused so you should check it out and buy her stuff. Hey, I'm trying to keep this brief and to the point here. YEEEAAAAHHH, it was nice...there were beaches, motorbikes and lots of fresh, fabulous food. It was a successful trip, both for business and for getting back in touch with the market. With plans to visit more regularly I'll be able to keep up with what's new and find more, so feel free to give me tips for my next time- comments are open!